The landscape of hard rock music in 1988 looked very different, in comparison, to that of a decade earlier. When Saxon began their recording career in the late 70s, rock and metal were solely the reserves of the readers of Sounds magazine, the devotees of the Radio One Friday Rock Show and festival goers. By the late 80s, it was no longer considered such a niche genre: bands like Europe and Poison had scored chart success on both sides of the Atlantic; Def Leppard‘s ‘Hysteria’ was one of the biggest selling albums of the era and Guns N’ Roses were on their way to becoming a worldwide, stadium filling phenomenon. Whitesnake‘s ‘1987’ was selling by the bucketload to a broad demographic and even Metallica – a band that only a couple of years earlier seemed entirely marginal – were on the cusp of UK singles chart success, and yet Saxon, in terms of commercial success, appeared to be floundering. Following the tour for 1985’s ‘Innocence Is No Excuse’, founding member Steve ‘Dobby’ Dawson quit the band, leaving Saxon without a bassist and with far less of a moustache quotient. Without securing a replacement, the band re-entered the studio. 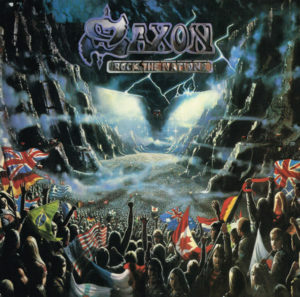 With Biff Byford handling vocals and bass duties for the recording sessions of what would eventually become ‘Rock The Nations’, Saxon wouldn’t lose momentum. This seemed like the natural solution until a permanent replacement could be found. As 1984 drew to a close so, too, did Saxon’s contract with Carrere Records. The past few years had been good to them, though: in a little over five years, they’d released seven albums for the French label, which scored six top twenty UK chart positions. That year’s woeful ‘Crusader’ aside, it represented an impressive body of work, one of which any classic metal band could be proud. Obviously, with Saxon being one of the decade’s biggest metal acts, a new deal wasn’t hard to secure and Biff Byford and the boys subsequently signed with giants EMI for a three album deal that would last the rest of the decade. 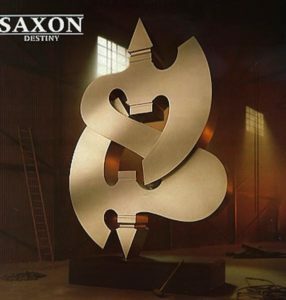 Released in November 1979, Saxon’s self titled debut LP was not the commercial success everyone had hoped for. Perhaps part of the blame could be levelled at Carrere Records – primarily a French disco label – not having the greatest experience of promoting a rock band. Maybe the problem lay with the album itself: while a hugely entertaining listen – especially from an historical viewpoint – it’s somewhat mixed in style. 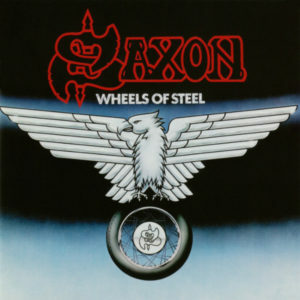 Tracks like ‘Stallions of the Highway’ and ‘Backs To The Wall’ point the way towards the brand of no nonsense metal Saxon would make their trademark, but others like ‘Frozen Rainbow’ have a footing much closer to a1970s almost past, a place where atmosphere and pomp outweighed sheer bluster. In those days, of course, bands weren’t dumped on the scrap heap by their record labels after a flop, and in Saxon’s case – and ultimately Carrere’s too, since the likes of Ottawan weren’t going to be around forever – it’s a good job. Decamping to Wales, the band set about writing their second album; the record that would change their fortunes and the face of 80s metal forever… ‘Wheels of Steel’.